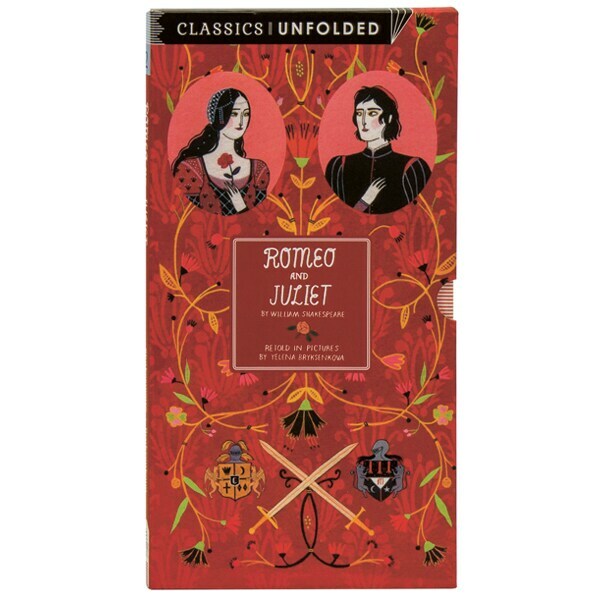 The children of two feuding families, Romeo and Juliet fall in love in this slipcased accordion book for readers 7 to 10, a beautifully illustrated 14-panel rendition of William Shakespeare's tragedy. Yelena Bryksenkova provides dramatic ink and watercolor paintings that suggest elegant stage settings as the lovers come to their heartbreaking end. The book illuminates key scenes, describes the action of the story, and provides memorable quotes from the original text. Unfolding to 37½ inches long, it can also be an attractive shelf display, and includes character portraits and additional brief tellings ("In 30 Seconds" and "In Five Words").